My reaction to Rahm Emanuel's stunning and decisive victory over anyone else in the Chicago mayor's race was neatly summed up by his friend and former White House colleague David Axelrod. "Two things are surreal: the nature of the victory and how fast it got counted," Axelrod told the Chicago Sun-Times. The nature of the victory is what I'm focused on. A race that many thought would lead to a runoff between Emanuel and one of the five other candidates didn't materialize. He won 40 of the city's 50 wards. According to the Sun-Times, Emanuel won all of the predominantly black wards in the city. "Emanuel appeared to be the 'consensus candidate' of the black community," the paper noted, "garnering a larger share of the votes than former Sen. Carol Moseley Braun, who came in fourth behind City Clerk Miguel del Valle. Braun had just under 9 percent, del Valle just over 9 percent." This is significant, given the racial pot stirring by Braun and Rep. Danny Davis (D-Ill.) after former president Bill Clinton announced last December that he'd campaign for his former staffer. 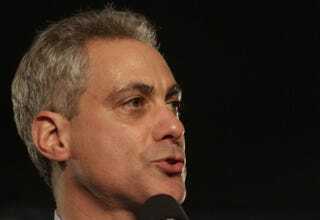 In all, Emanuel, who will become Chicago's first Jewish mayor when he takes office on May 16, walked off with the keys to City Hall with 55 percent of the vote. That's what I call a mandate. And Mayor-elect Emanuel is going to need it. He will take over a city grappling with a $600 million deficit in its $6 billion budget and a pension system that Emanuel has described as unsustainable.